Christopher Ralling, a British journalist and broadcaster, has had a long and distinguished career in broadcasting and had won many international honors which include 2 Emmys and 2 British Academy Awards. He recently published “Scrapbook for Jessica“, which is part scrapbook and part memoir, covering his life, his family and background and of course his career BBC radio and television. As its title indicates, the book was written for Ralling’s grand-daughter, Jessica, who is now a teenager. 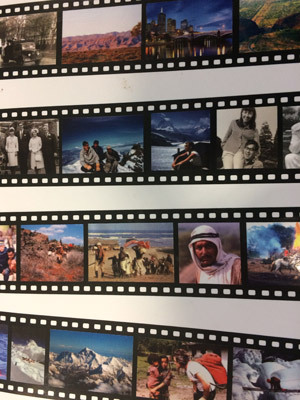 Christopher, who is now 87, very kindly decided to donate proceeds from the book to SolarAid as “a nice small charity which does a great job”! 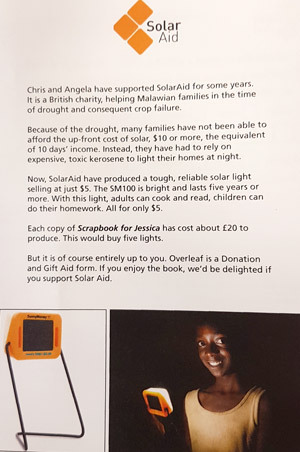 Sending out the book to friends, family and other professional contacts, Christopher included a small leaflet in each copy encouraging recipients to make donations to SolarAid if they felt so inclined. 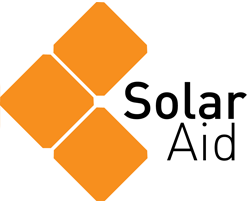 We are extremely grateful to Christopher for nominating SolarAid and have been extremely encouraged by all the generous donations we have received. The book is an amazing collection of all sorts of fascinating stories and has so far raised over £1,395 for SolarAid! Thanks Christopher.